Residents in a Detroit neighborhood received a scare this week when they found what appeared to be eviction notices on their doors. The flyers, however, turned out to be political pamphlets in opposition to the construction of a controversial new bridge. The fake eviction notices were posted by a local chapter of Americans for Prosperity, the conservative political advocacy group backed by Charles and David Koch, the billionaire brothers who run Koch Industries and are longtime libertarians. Local political leaders and columnists are condemning the group for scaring residents -- whose homes sit in the epicenter of the nation's foreclosure crisis -- while refusing to disclose which of its corporate backers are funding the flyers. At the center of the flyer in question, in large print, reads: "Eviction Notice." 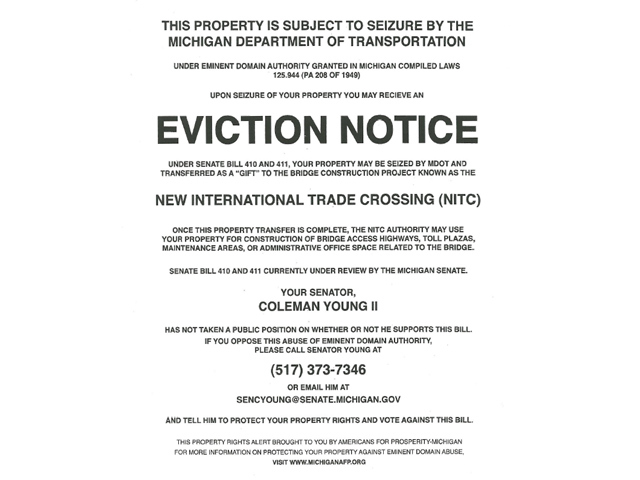 In medium print, the top of the flyer reads, "This property is subject to seizure by the Michigan Department of Transportation." Only in small print does the flyer say the property in question could be seized if legislation approving the bridge is passed. Michigan's Republican Gov. Rick Snyder supports the bridge construction, as did his Democratic predecessor Jennifer Granholm. The bridge would link Detroit to Canada, and Canada has agreed to fund a loan for its construction. So far its construction has failed to receive state legislative support, in part because of lobbying, particularly from private bridge company Ambassador Bridge, the Michigan Messenger reports. Calling American for Prosperity's fake eviction notices "emotional terrorism," Detroit Free Press editorial editor Stephen Henderson points out that if the bridge project were approved, no one would be technically "evicted" -- the law requires that any land acquisition for such a project come with remuneration, and land owners in areas with depressed home values can even end up better off. Still, the fake eviction notices had residents on edge. Resident Steve Toth told the Free Press his elderly mother saw the flyer and "damn near keeled over," while one of his neighbors was "beside himself." Scott Hagerstrom, American for Prosperity's Michigan state director, told the Free Press the group had no apologies for the flyer. "It was meant to startle people," he said. "We really wanted people to take notice. This is the time that their opinions need to be heard. We wanted people to read it." State Rep. Rashida Tlaib reportedly said the flyers created "chaos" among her constituents. State Sen. Coleman Young II, whose name was on the flyer as the politician to contact about the bridge, called the flyer "slime-ball, gutter politics." "Americans for Prosperity has linked arms with Ambassador Bridge Owner Matty Moroun in order to preserve the monopoly Moroun enjoys now," Henderson wrote. The Detroit International Bridge Co. -- the operating arm of Ambassador Bridge -- released a statement saying it had nothing to do with the flyers, even though it has been lobbying heavily against the bridge. "Let me be clear that the Detroit International Bridge Co. had nothing to do with the bogus eviction notices posted at homes in southwest Detroit yesterday," the company's president Dan Stamper said in a statement. "Although we disagree with plans for a bridge that would disrupt the neighborhood and displace residents, we would never distribute misleading information to disturb or upset residents." Still, it's impossible to know who is behind the Americans for Prosperity campaign since recent developments in campaign finance, including the Supreme Court's 2010 Citizens United decision, allow such groups to keep its donors private.